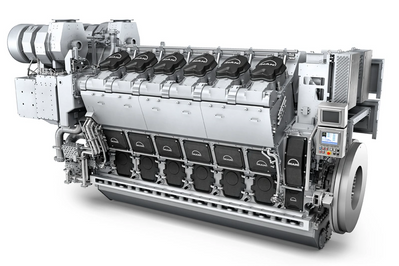 Canadian shipbuilder Seaspan Shipyards announced Tuesday it has awarded MAN Energy Solutions Canada of Vancouver, BC, a contract valued at $55 million ($41.2 million US) to provide propulsion and power generation components for Canada’s new Joint Support Ships (JSS). The contract was announced today but was awarded and signed late last year, a Seaspan Shipyards spokesperson confirmed to MarineLink. MAN will provide two MAN 12V32/44CR (Common Rail) propulsion engines equipped with environmental protection SCR technology, reduction gears, propulsion shafts, propellers, ship service diesel generator sets and an emergency diesel generator set, the shipbuilder said. Seaspan held a steel cutting ceremony in June 2018 for the first of two JSS it plans to build for the Royal Canadian Navy. The new naval supply ships will deliver fuel and other supplies to vessels at sea in support of the Navy’s defense and humanitarian missions, and they’ll also offer medical/dental facilities and provide support for helicopter operations and equipment repair. Once completed, the 173-meter vessels will be among the largest ships ever constructed on Canada’s West Coast. Work on the MAN power an propulsion components will take place at the manufacturer’s established facilities in Europe. The integration for these systems, training, testing and support during the harbor acceptance trials and the sea acceptance trials will be performed in Canada. “Seaspan Shipyards is pleased to announce this major contract award for MAN Energy Solutions Canada to provide a crucial system for the Joint Support Ships. Contract awards like this mean that the women and men of the Royal Canadian Navy will benefit from state of the art systems aboard these new vessels,” said Mark Lamarre, Chief Executive Officer, Seaspan Shipyards. In addition, as a result of this contract, MAN is investing in new facilities and creating jobs on Canada's Atlantic and Pacific coasts. The company has already invested in systems integrator Aspin Kemp and Associates (AKA) from Prince Edward Island, thus supporting the Government of Canada’s objective to reestablish and grow the Canadian maritime industry and provide access to world markets under the National Shipbuilding Strategy (NSS). MAN is also supporting education initiatives and has provided the British Columbia Institute of Technology with the largest training engine on the West Coast. MAN is one of several major systems integrators that Seaspan is working with in order to meet its commitments under the NSS. With its work under the NSS, which includes building ships for the Canadian Coast Guard (CCG) and Royal Canadian Navy (RCN) in Canada, Seaspan has developed more than $850 million ($637.2 million US) in committed contracts with approximately 570 Canadian companies.